I so seldom play with color, but I have to admit it's a lot of fun! This will be the Limited Edition after next (next will be Plumaria). I called it Paisley Rose, it's a blend of rose and sandalwood with Shea Butter. The color looks lavender, and is supposed to end up pink, the color will depend on the actual soap itself, so we shall see tomorrow when I slice it! 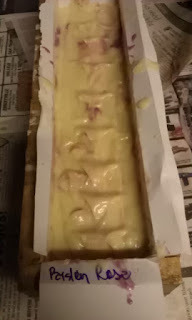 I'll post a picture for you then, so here it is in the mold, most of the color will show after it's sliced.